Speaker Paul Ryan, R-Wis., says he'll get a new Ford F-150 when he retires from the House at the end of this term. Tom Williams / CQ-Roll Call,Inc. The car was parked at his mother's house in his hometown in Wisconsin, and when she came back from her annual trip to Florida for the winter, it wouldn't start. As a top congressional leader, Ryan has a security detail and hasn't been allowed to drive in three years. 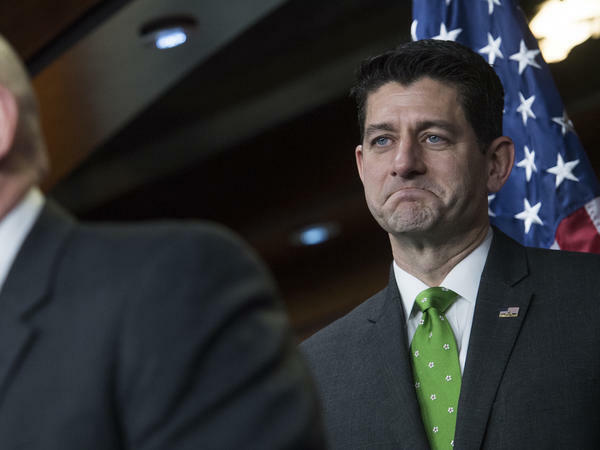 "So I towed it into the dealer, they put it up, and they realized that a family of woodchucks lived in the underbody of my Suburban," Ryan said. Ryan told the story after giving a speech about how he feels Republican policies, like last year's tax overhaul, have helped the economy. He disagreed, however, with President Trump's decisions to impose tariffs on a number of nations, most recently on China. "The rulebook for the global economy of the future is being written right now," Ryan said. "The question is whether the United States will be holding the pen." During a question-and-answer session after his speech, Ryan said he liked his previous job, as chairman of the House Ways and Means Committee, better than his current position as House speaker because he considers himself "a policy guy." He also addressed the elephant in the room that comes up as he completes his final months as the speaker — what he is planning to do next. Asked whether he is considering a run for president, Ryan didn't sound interested — for now. "You never say never to such things, but I really, really do not have it in my mind," Ryan said, before adding "for sure not while my kids are at home, and they're home for the next five years." He did say, however, that he would be getting a new Ford truck upon retirement, to replace the defunct Suburban. And he renewed his license so that when he no longer is escorted around in a government vehicle, he can drive his new truck.